I have had a can of condensed milk in my cupboard for a few months now, with the intention of making fudge, and hadnt gotten round to it. The other day I felt like making something, so out of the cupboard it came. I looked in my cupboard to see what I could find, and thid is what I came up with! And here is my recipe. Enjoy! First of all sift all of the dry ingredients into a large bowl and combine for an even mixture. Then place the butter and the condensed milk into a saucepan and heat until slightly bubbling. Once fully combined keep whisking on a low heat until smooth and glossy. Take off of the heat and mix in half of the marshmallows and the crushed biscuits. Pour into a lined brownie tin. 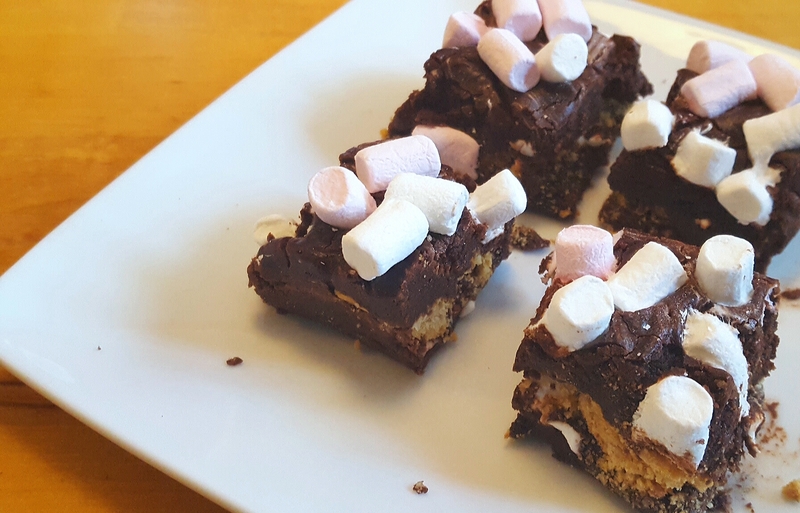 Top with marshmallows.Use a small sheet of greaseproof to push down on the marshmallow topping, just to make sure it is stuck. Refridgerate for at least 2 hours, until set. Turn out of the brownie tin and remove the greaseproof. Cut into little squares and enjoy! I think this fudge is really yummy! Its almost like eating a really fudgy brownie! I love it! I hope you do too! Ooh yum! 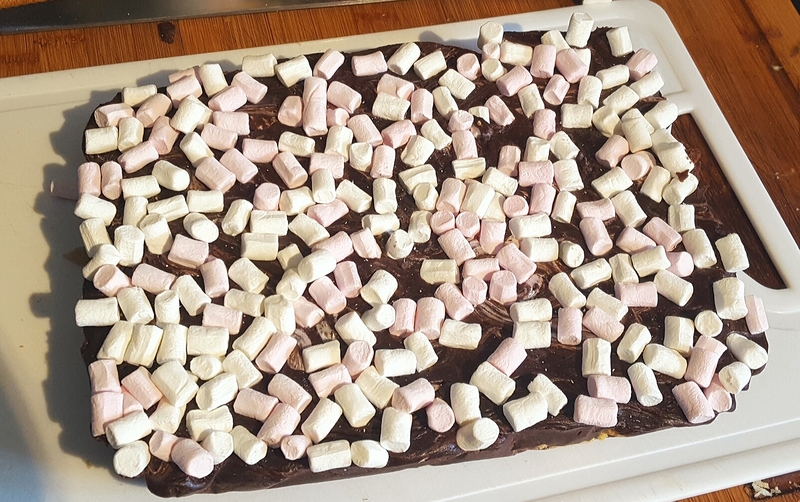 I made white chocolate rocky road last week for our Messy Church group, it went down well too. Sounds delicious, apart from the marshmallows (hate them!! ), but I could leave them out. Adding the biscuits is a great idea! I have never met a person who didnt like marshmallows! I like anything sweet! You could leave them out or substitute with chopped glace cherries, fudge peices, whatever you like really! Chocolate goes well with almost anything! I know, I haven’t met anyone who doesn’t like marshmallow either! Cherries are a brilliant suggestion though – thanks!